My first contact with Japanese people was at the airport of Kuala Lumpur. I had a 4-hour transit before my next flight, and I spent it wandering around the 8 spokes of the terminal and their many shops. There was a chocolate shop with Japanese employees who seemed amazed at my hair; they not only asked me if it was natural, they started playing with it like children with a new toy. 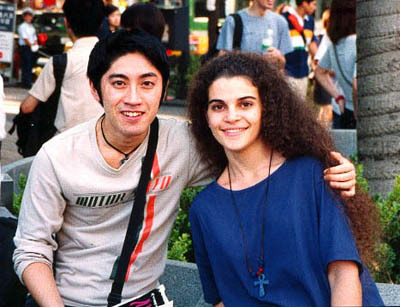 Anne was waiting for me at Narita Airport as she had the previous year in Melbourne. 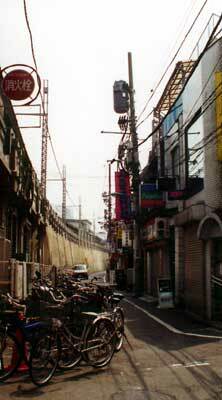 Together we took three consecutive trains to reach Ôkubô, a suburb of Tokyo where we would be staying for a week. As we walked down the narrow streets to the apartment, I met my first chikan (drunk), lurching precariously with a look of "Where am I?" on his face. I was still laughing when we reached the place and left our shoes at the door to respect to the most tenacious of Japanese customs. I had made contact with Tokyo! I was exhausted but stayed up until Tatsu returned. Tatsu is Anne's close friend and it is him we were staying with. Our meeting was one of the most embarrassing moments of my life, as Anne loves to remind me. I was so sleepy I completely forgot where I was, and when he arrived I did the Lebanese thing: shook his hand while kissing him on both cheeks. Fortunately for me, Tatsu had lived in Turkey and after the first moment of astonishment he remembered the odd ways of the Middle-East! As we were eventually going to move to Tatsu's family house in the village of Takao, we took most of our things there that day. I still wince when I think of Tatsu moving his Mac (we're talking big computers back then) by strapping it on a caddy and pulling it through the streets. Everything I saw was a discovery to me. 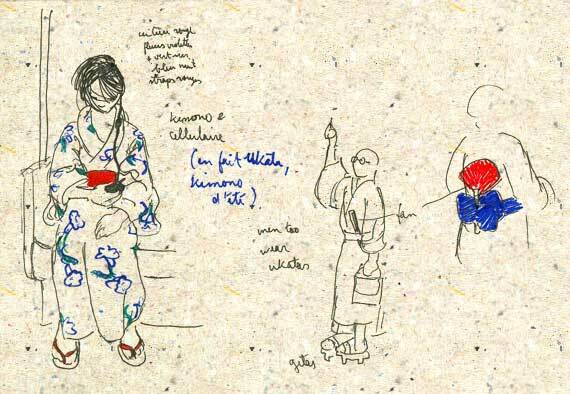 I was amazed to see people, young and old, wear the yukata (summer kimono) when I thought it wasn't used anymore; it seems that on the contrary, it is very popular during the heats of summer as it is cooler than Western clothes. Even the uncomfortable-looking wooden sandals are still worn, and almost everybody carries a fan around. 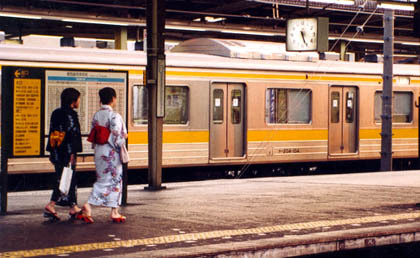 The trains are the coolest part of Tokyo, as they have air conditioned while homes do not! Takao is a lovely, welcoming village at the foot of Takao-san, Mount Takao. Contrary to popular belief, mountains are not called yama (as in Fuji-yama) but are addressed with the honorific suffix of san: Fuji-san, Takao-san. This same suffix is used to speak of other people. As for the suffix chan, it is used for endearment, so that the three of us were soon addressing each other as Tacchan, Anchan and Macchan. There was nobody home when we reached the family house, but we went straight in as the door was unlocked. 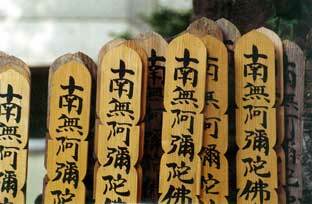 Such is the natural honesty and sense of honor of the Japanese, that there is no fear of burglary or theft. 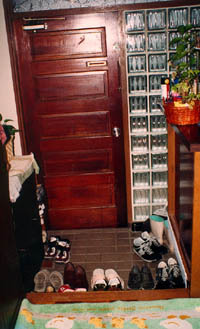 We left our shoes in the ginkân again: it is the space inside the door that serves as a buffer zone between the "dirty" exterior and the clean inside (traditionally, Lebanese homes had the exact same feature, called juret el-bab). 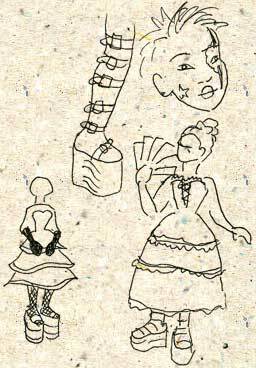 One must not stand without shoes in the ginkân -- I'll leave you to imagine the contortions that I had to go through every time we came in or went out, especially that I hadn't thought of that habit and had only brought laced shoes. By that time I had already filled my sketchbook with Kanji characters that I saw often. At the time I still didn't understand them well, but I fell in love with them so much that I would spend the following year studying their system and writing a thesis on them. 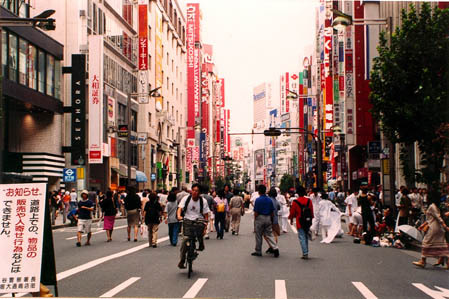 That day I went to Shibuya for the first time. 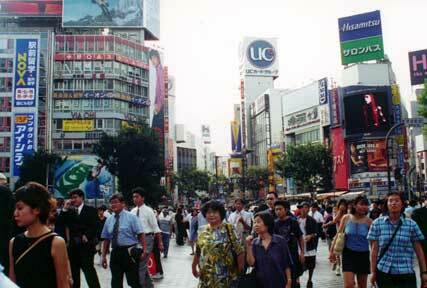 Noted in my travel journal: "Shibuya: Out of the future megalopolis! The busiest crossing in the world". And so it is -- literally hundreds of people pouring in the streets when the pedestrian light goes green. Seen from above, it is like watching a crowd of supporters take the field during a ball game. 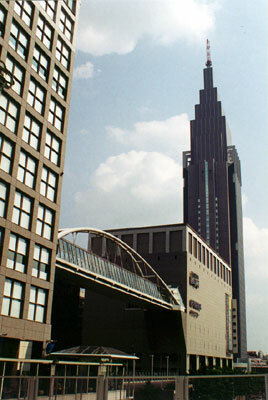 Shibuya is also where you'll find Hachikô, the famous dog, or at least his statue. 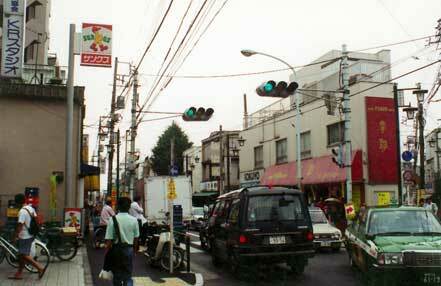 Hachikô was born in 1923; he died on that spot while waiting for his master, who had had an accident in the meanwhile. A bronze statue was erected to his memory, and it is now a favourite meeting place -- so popular benches have been installed around it for the people who wait. In the evening Tatsu took us to a restaurant called Las Chicas where we had Vietnamese and Italian dishes – no Japanese food for me yet, except the soba noodles I had had at lunch. Shinjuku Gyoen, one of Tokyo's many "lungs"
On our way back from Shinjuku Gyoen we passed in front of a small Buddhist cemetary. I was amazed to see it bloom between the modern buildings the way it did. The Japanese have a unique ability to preserve the past and embrace the future. Nowhere did I notice a conflict between the two: they are both given the same importance and respect. It is the same with religion: Anne explained to me that they are both Shinto and Buddhist: they take what they like from both. 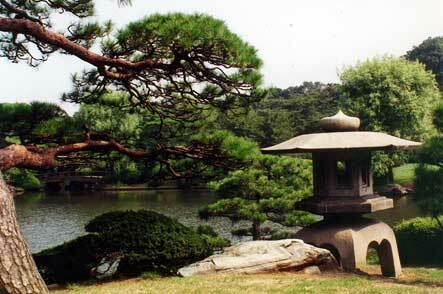 Spirituality is present everywhere in Japan. Its very omnipresence makes the existence of religious pressure unnecessary, and the result is a truly pure and friendly feel in all the temples I have visited. More importantly, they have such respect for everything under the sun that everything is sacred, and every place holy. From prayer sticks and moss-sewn Buddha statues, we went straight and by chance to the funkiest, most futuristic aspects of Tokyo. We were supposed to visit the Meiji Shrine, but instead got caught up with an unusual sight at the Harajuku station. At first I thought they were funky work uniforms, then I could have sworn they were disguises for some special occasion, finally I believed it was an open-air catwalk. 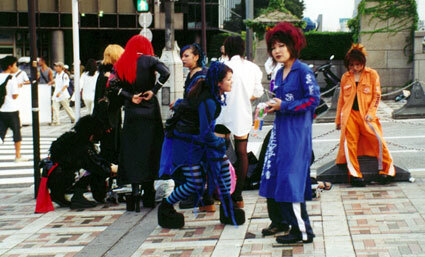 But no: Harajuku is one of the places where Japanese fashion exhibits itself every Sunday, as groups of young people gather to chat and cosplay. That night we had dinner at Anatolia, the Turkish restaurant where Tacchan worked. It is with much amusement that I pondered the irony of coming all the way to Tokyo to have "meat on dough", something I had on a daily basis in Beirut. The evening ended in a karaoke bar. Karaoke the Japanese way is highly addictive. You and your friends are given a small sound-isolated booth that is equipped with a TV, sofas, 2 microphones and a phone. You can phone to order food or drinks; you pick the songs you want and take turns with the mic. We sang for 4 hours that night, and had lost the use of our vocal chords by the time we headed home.